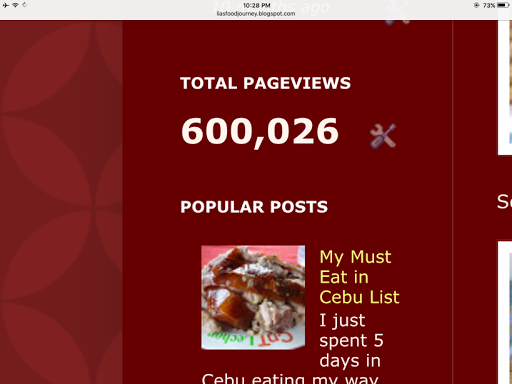 Lia's Food Journey: 600,026 And Counting! I have over 600,000 page views! When I first started my blog, I used to ask myself, "Who will read my posts? I'm a nobody." I know my friends and my Ate would always check it out, several times, over and over. Then people started writing to me via the comments section that they have been following me for several years already. Strangers would stop me in my tracks to say hello and introduce themselves as one of my followers. That's how I met FGM and Vicky! I would get embarrassed sometimes when friends quote me verbatim! I did not expect that this blog would last this long. I thought it would die a natural death knowing me and my short attention span. Still here ... sharing my recipes and experiments. It is just too hot lately to cook in my kitchen so no new recipes at the moment. I guess you just have to content yourself with the 300 plus recipes here in my blog. My friends say that my blog is like a teleserye, but more of a kainserye. They wait what I would post and they get inspired to either cook whatever I ate or eat it in the restaurants. I am very delighted that I have reached this far. Thank you for reading my blog. Thank you for allowing me to share myself with you. Every time I write, I have all of you in mind hoping you learn something from my recipes or put a smile on your face when I tell you funny stories about me and my food journey. i am a fan of your blog, it's easy to follow and i can really feel how passionate you are in cooking. :) more recipes to post! Thank you, Joan! I am constantly experimenting with recipes so I can share it with all my readers!